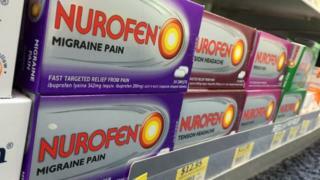 The UK manufacturer of Nurofen has been hit with an increased fine of A$6m (£3.6m; $4.4m) for misleading customers in Australia. Australia's Federal Court ruled last year that products marketed as targeting specific pains, such as migraines, were actually identical. Reckitt Benckiser was fined A$1.7m in April, but Australia's consumer watchdog argued the sum was too low. The court on Friday agreed to increase the penalty. "The objective of any penalty in this case must be to ensure that Reckitt Benckiser and other 'would-be wrongdoers' think twice and decide not to act against the strong public interest," the court's justices said in a joint statement. The pharmaceutical giant was also ordered to pay the Australian Competition and Consumer Commission's (ACCC) legal costs. The ACCC said the company had profited substantially from misleading customers on products including Nurofen Back Pain, Nurofen Period Pain, Nurofen Migraine Pain and Nurofen Tension Headache. "This is the highest corporate penalty awarded for misleading conduct under the Australian Consumer Law," ACCC Chairman Rod Sims said. "The ACCC welcomes this decision, having originally submitted that a penalty of $6 million or higher was appropriate given the longstanding and widespread nature of the conduct, and the substantial sales and profit that was made." In a statement to the BBC, Nurofen said it acknowledged the court's decision but would seek legal advice. "Nurofen is disappointed by this decision, as it considers that the original penalty of the Federal Court in April was appropriate in all of the circumstances," the statement read. The court in April ruled that Reckitt Benckiser had contravened Australian consumer law by saying its Nurofen Specific Pain products were each formulated to treat a specific type of pain. The company said: "Nurofen did not intend to mislead consumers, however we recognise that we could have done more to assist our consumers in navigating the Nurofen Specific Pain Range." Earlier this year, Reckitt Benckiser removed a TV advert for one of its products - Nurofen Express. The advert had implied that the capsules directly targeted muscles in the head. The company has said it will not re-broadcast it, following complaints that the ad was misleading.